Nearly a decade ago, Thailand’s government amended its constitution to create a more self-sufficient economy, encouraging local and national sustainability activities. 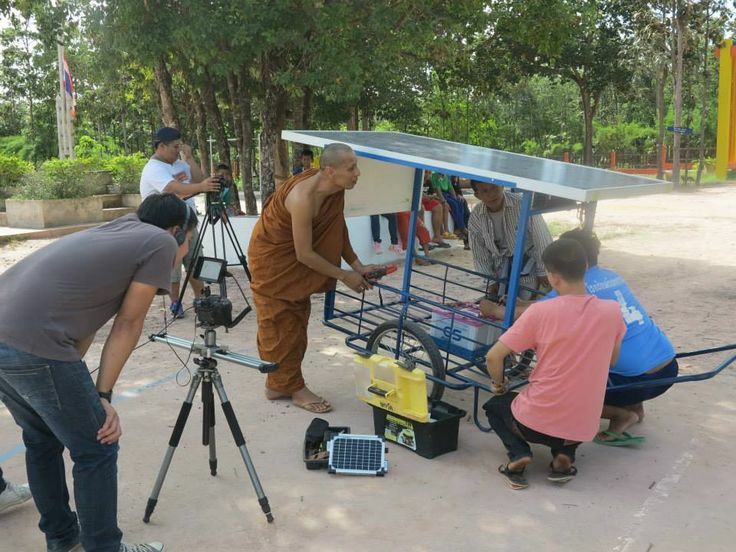 ProgressTH, a Thailand based advocacy group, has dedicated its February 5, 2016 blog to the discussion of a new high school powered by solar energy that teaches its students how to live an economically and environmentally sustainable lifestyle. Situated in the forests of Thailand’s northeastern Ubon Ratchathani province, the Sisaengtham School, known as “The Solar School,” was founded in 2010 by Thai monk, Prakruwimolpanyakhun. Inspired by Thailand’s national policy, Prakruwimolpanyakhun wanted to create a school that not only would teach students basic literacy and arithmetic, but also the values and practices of Buddhism, community outreach, environment science, self-sufficiency and sustainable technologies. The benefits of this innovative curriculum and solar foundation are numerous, allowing the Solar School to become entirely self-sufficient. Financially, for example, the electricity bill is equivalent to one US dollar per month. This is because the school runs entirely on renewable energy sources. This dependency on renewable energy also provides students with the opportunity to understand and work hands-on with the technology. Since the school is tuition-free, income for the school is brought in by the students’ practical application of their acquired skills. The students are taught to grow organic produce, which feeds the students and funds their school through sale to the local community. The students also learn to manufacture and sell solar kits, from solar-powered flashlights to more complex systems that power an entire home. Through this inventive and practical education, students acquire the skillsets to live their own financially sufficient and environmentally sustainable lives, and are able to specialize in any number of career fields related to the environment and solar technology. The ‘Solar Monk’s’ hope is that his students may inspire, teach and transform their own communities for sustainable living. This entry was posted in Samantha Englert, Solar Power and tagged activism, community, Energy, greeneducation, progressTH, Sisaengtham School, solar panel, Thailand, thinkgreen by Emil Morhardt. Bookmark the permalink.